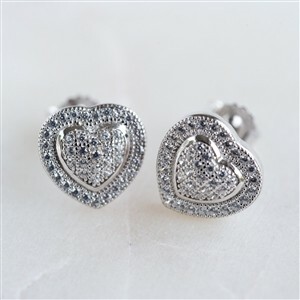 Sterling silver heart earrings with pave set cubic zirconia stones and butterfly backs. Presented in personalised gift box with engraved silver plate fixed to the lid of the box, we can engrave up to 30 characters. If you're sending direct to the recipient, we can pop your gift in a gorgeous quality gift bag with hand written gift tag. Just add our gift bag from the menu! The word Micro Pave (pronounced Pa Vay) is derived from the French word meaning 'pavement'. The reason behind this name is, just like stones are paved on streets, diamonds (or any gemstone) is paved (tight grouping of teeny tiny size stones) on the surface of a piece of jewellery in this setting. It creates a sparkling surface of diamonds on metal with little or no space between the diamonds. For example, band of a ring set in pave gives the illusion that band is completely made of diamonds, just like these studs.